On a fairly warm Southern California Monday, I headed down Newport Boulevard to Orange. Orange has a bad rep. Really I think it is only known for downtown Orange which is undergoing a revitalization. New restaurants and high end shops are popping up around the Orange Circle. If you haven’t been in a while its worth the go. The suburban side of Orange does not disappoint. It’s lush with some gorgeous sprawling homes and some very posh gated communities. And lots of folks have horse stables right on their properties. So I was it was a brilliant stroke of luck to photograph Sabrina’s Rhone Horse Andy. 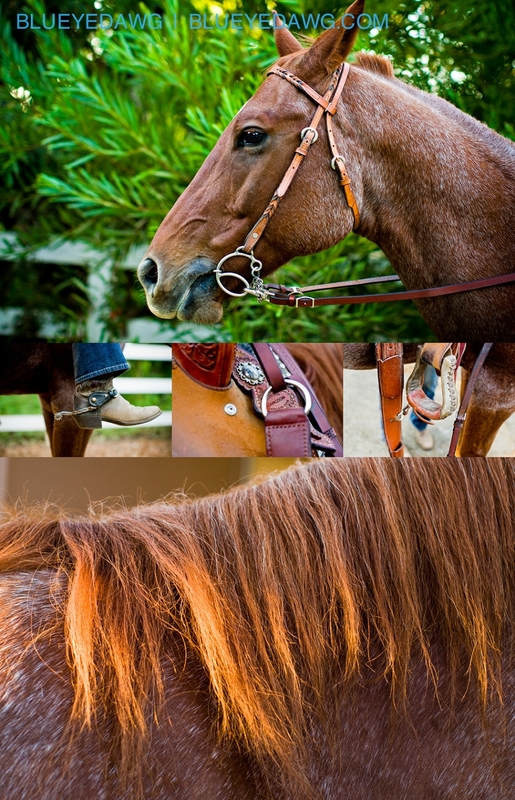 I love spending my Monday as an Orange County Horse Photographer! As I rolled up to Arthur’s place in Orange I was a bit nervous but certain of my skill set. I’ve always wanted to do Equestrian photography but hadn’t had the opportunity before. I parked my car and walked down the dusty trail passing by the coral and headed towards the barns. Thirteen year old Sabrina was talking with her friend Kevin and she was prepping Andy. Two things immediately struck me when when I met Sabrina: Her blue eyes and the cute dimple in her chin. I was jazzed that she chose a lovely blue plaid shirt that accented her eyes for her shoot. She looked just perfect. 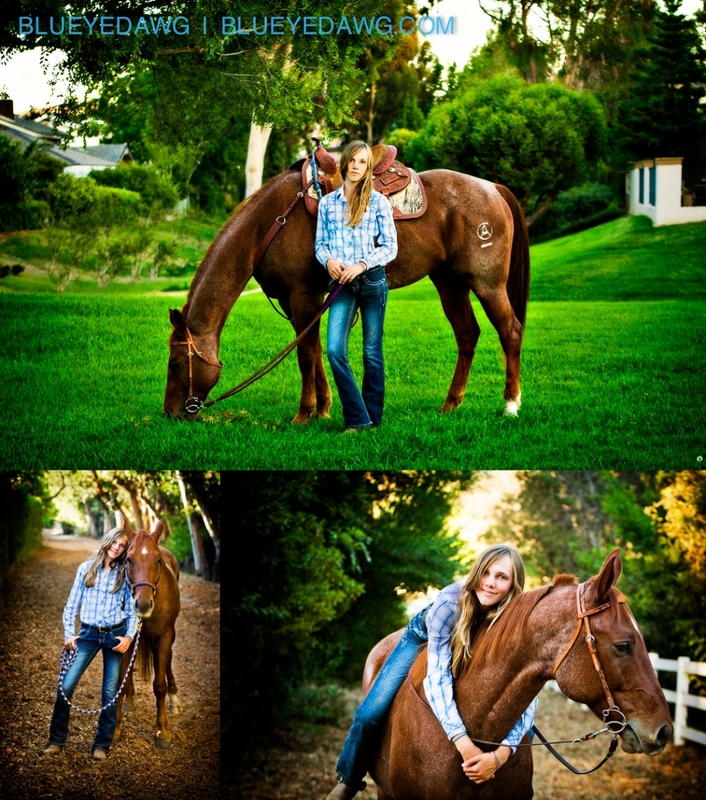 Her dad Arthur and her both have horses on their property and enjoy riding when ever they get a chance. Andy is a much loved, gorgeous Quarter Horse with a Rhone coat. Rhone is a reddish color with flecks of white hair that accent his coat. The American Quarter Horse is an American breed of horse that excels at sprinting short distances. Sabrina loves barrel racing and just recently completed an intense seminar with Charmayne James (11 time barrel racing champion) to better her barrel racing skills. I got to pet Andy and feed him some carrots. Arthur is a kind spirited man. After their session he invited our daughter Claire to spend the day with Sabrina. Claire is super excited for the opportunity to meet Sabrina, learn to ride and help brush, wash and clean Andy. P .S. I have a few quirks. But this may be one of the strangest ones I have. In the right setting I like the earthy smell of horse manure. In moderation. It just reminds me of nature and the outdoors. 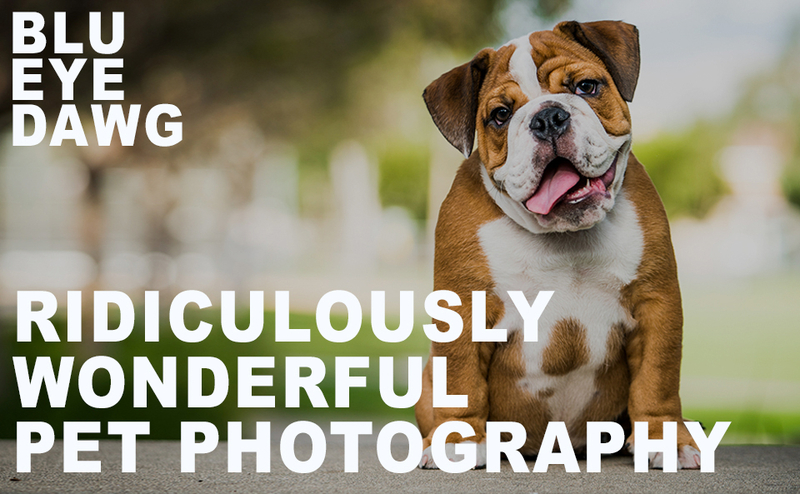 @blueyedawg.com Ridiculously Wonderful Pet Photography 949-494-5084|ProPhoto Site by NetRivet, Inc.